The Frapin line of fragrances has (somehow) escaped my attention; blame it on a flooded market, a lack of time and energy to find samples, or being in a perfume-induced stupor: “No more perfumes! Enough!” So: a year after its introduction, I’m finally sniffing 1697 (named after the year the Frapin family was ennobled by Louis XIV). 1697 was created by perfumer Bertrand Duchaufour and includes notes of cabreuva, dark rum, acacia, davana, pink pepper, jasmine, hawthorn, ylang ylang, cloves, cinnamon, sweet dried fruits accord, rose, ambergris, myrrh, tonka bean, patchouli, cedar, cistus labdanum, white musk and vanilla. 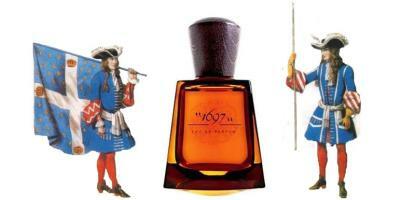 When I wore 1697 for the first time, its burnt sugar and rum reminded me of an ancien régime version of Idole de Lubin (1697’s notes are darker, rougher and more infused with booze). I’m a fan of 1697; it’s a liquor-y (fortified wine) gourmand. Frapin 1697 Eau de Parfum (definitely unisex) has good lasting power and reasonable sillage; it’s $155 for 100 ml. For buying information, see the listing for Frapin under Perfume Houses. Thanks Kevin for a great review of this DELICIOUS fragrance! which had a very modest sillage – at least on my skin. Labben: you’re welcome…and didn’t even know about the extrait. FragrantW: Should I hope you find something…or not? HA! I tried the earlier, limited-edition version of this (a stronger concentration, maybe?) and loved it. Another from Frapin that my husband and I both liked was Terre de Sarment, which is sort of a musty citrus. Janice: musty citrus sounds good…thanks for the tip. I loved this for the first hour, and then i felt as if it kinda became too dull and lost all of its momentum. The other Frapins worth trying should be 1270, and Caravelle Epicee. Dont bother with L’Humaniste, it smells like Formula 409. Rictor: Caravelle seems to get lots of attention. I got a sample ages ago and wasn’t thrilled. It’s the only other Frapin I’ve tried. If only we could combine our experiences! The first hour is my least favorite part of wearing this perfume. My favorite Frapin is Caravelle Epicee. I really like L’Humaniste, thought. It smells better on my husband than on me, but I think it is very nice and can be worn all year round. I remember liking Terre de Sarment when I tried it, but definitely my favorite is Caravelle. Arwen: thanks for the recommendations. When Rictor said L’Humaniste smells like Formula 409 I’m intrigued! Hello all, first comment here. I recommend L’Humaniste, which takes a bit of time to fully appreciate as well as 1270. AirBureau: welcome! And I will try both of those fragrances. Thanks. Was testing this today and decided it was too sweet on me. My boozy rum love is Idole de Lubin which I already own so my pocketbook (who says that?) is thankful ! Basia: Idole is very nice. Kevin – I highly reccomend 1270. It’s lucious – dried fruits, nuts, spices, boozy, woody, warm, – totally decadent. It was one of the first non-mainstream fragrances I tried and it stunned me with it’s richness and complexity. I knew I had to have a FB. 1697 sounds so good too – it’s been on my list to try, but I still haven’t managed to do so. I’m seconding that 1270 recommendation; like Rusticdove, it’s a favorite of mine. 1697 just went onto my To Sample list. Ha! I just re-read my comment. Rusticdove IS a favorite commenter of mine, but I was actually referring to 1270 as being a favorite perfume of mine. Rusic: Ummmm…1270 sounds great…will try it for sure. Sarah, I’ve deleted your other message. I’m sorry but it just isn’t appropriate to bring these kinds of disputes to the comments on a fragrance review. I wish you good luck and hope you get everything worked out. D*mn it I knew I should have gone for a bottle of the EDP when it was on sale at Les Senteurs earlier this year! I have a small decant of the extrait and it’s too thick for me but reviews of the EDP have generally been good. It seems a bit of air has been introduced which is no bad thing here. It is delicious. I would also recommend 1270. More fruity boozy and quite luscious. Great in the Winter…..
Hello Kevin, thank you for the review. I retail all the Frapin perfumes in the UK and would like to send you the samples. Please email me at enquiries@estellana.com. Have someone reviewed Esprit de Fleurs? I’m interested in others’ opinion about this one, pls! I liked it, quite unexpectedly, especially the drydown. Still cannot believe myself! Who would have thought that, considering my usual taste being wood/spice and going up to desert Marocain & Dzongkha. I’m mystified. Are there any similarities between the two and EdeF, I wonder? An expert opinion, pls? In Re to 1270 that everyone’s commenting on: no brainer it’s the best in Frapin (IMHO). Not such a big fan of 1697 though. Salamandra: haven’t smelled Esprit but will try it soon. Nice to read your take on this. I have to say briefly that I love Frapin 1270, with all its boozy fruitiness. I had a decant of the original extrait version of 1697 — it was pleasant, but I had to give it away because there was an accord in there that completely rubbed me the wrong way, and which I found identical to an accord in Havana Vanille/Vanille Absolument, another Duchaufour creation. The accord was somehow “plasticky” to me — hard to describe. I was happy to pass it to a friend who loves 1697. Hi, Joe! Seems the extrait wasn’t as well received as the EdP. Didn’t get the “plastic” in the EdP but I’m not a fan of the others you mentioned either: Havane Vanille/V.A.